The IBT Constitution outlines the way the IBT is organized and operated, and dictates the rules for the election of IBT officers. The Constitution also mandates the IBT’s authority over local unions. That mandate also includes authority over member eligibility, the collection of per capita assessments from local unions, the requirements of local union elections, and rules to ensure that local unions are run in a responsible and democratic manner. The IBT also coordinates Teamster political activity through the Political Affairs Department. Political activity is funded by contributions from individual Teamster members under DRIVE. Please talk to your shop steward or union business representative about the DRIVE program. Local 690 is a not-for-profit corporation that is chartered by the International Brotherhood of Teamsters as one of its local unions. 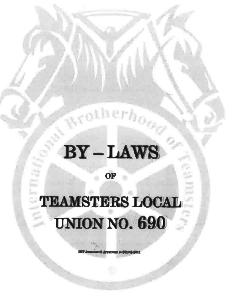 Local 690 has its own set of Bylaws that dictate the duties and powers of the officers and trustees, how local union elections are run, how dues, initiation and other fees are assessed and the requirement that the membership approves certain actions of the administration by a vote of members attending General Membership meetings.